It is important to properly perform tests for image quality and safety purposes right after the installation and during routine operation of a dental x-ray unit. Having a quality control (QC) program for dental x-ray facilities is instrumental in ensuring that patients are not receiving excessive radiation during their examination. A QC program also ensures that the dental x-ray imaging equipment is working properly, as exemplified by scientific and technical testing to confirm that the machine is performing as per manufacturer’s specification and regulatory requirements. 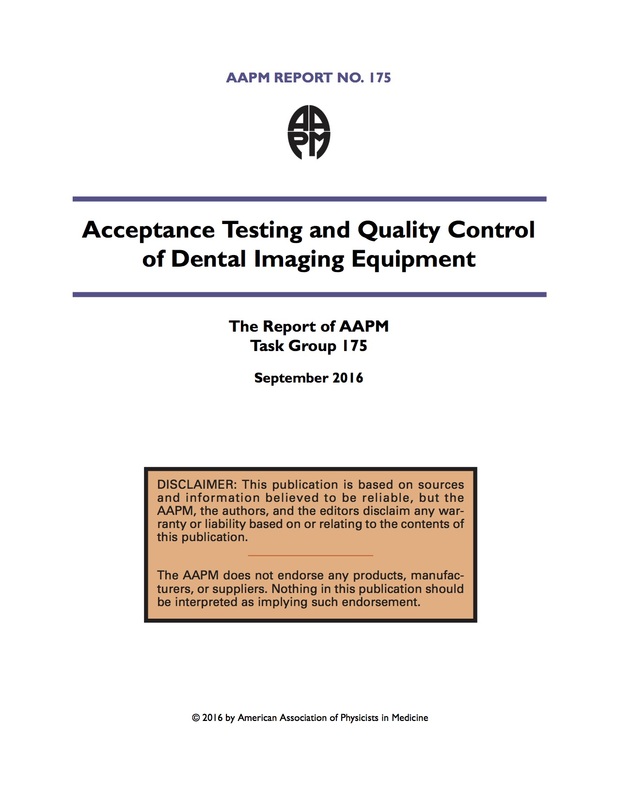 Recommendations for specific parameter evaluations and practical procedures for quality control evaluations of dental imaging equipment are described in this document. Section 2 of this report provides image receptor recommendations for intraoral dental units. Sections 3, 4, and 5 provide information for the evaluation of intraoral, panoramic, and cephalometric dental units, respectively. In addition, all methods mentioned in this report are intended to provide guidance on how to perform these medical physics tests, but they are not intended to be the sole methods for performing any particular evaluation. While cone-beam CT (CBCT) has become common in the offices of many dental specialists, this modality falls outside the scope of this task group report. Another AAPM task group (TG-261) will be addressing CBCT for dental and maxillofacial imaging, and their report should be forthcoming.